Is it time to sell and downsize, using some of that gain for retirement savings and to renovate a smaller home to just what you want? Is it time to move to a bigger home? Is it better to stay put, and renovate the family home to better fit your needs, while remaining in the neighbourhood? For a new buyer, is it the moment to get into the market, either with a brand new condo, or an older house or duplex that needs lots of work, and if so, where? If you are considering buying brand new, it is important to understand that brand new condo developments or townhouse also come with unknown costs. How well were they built? How high will the strata fees be once the building is occupied? Will the condo environment offer the same kind of neighbourhood and social amenities one is used to, or likes? If not right away, how long will it take for a building and new neighbourhood to develop “character”? What about property transfer tax, legal fees, assessments? Realtor costs? Moving costs? Furniture? While a brand new development allows one to sidestep renovations, they can come with surprises – the rooms are smaller than they appeared on plans, the kitchen or bathroom is not up to snuff, or the layout is not as described. All this can lead to a home renovation to redo the space to better meet ones personal needs. If you’ve decided to stay put and do a home renovation, or buy an older place and fix it up, here are a couple of factors to consider. When undertaking any home renovation, always get an estimate from two or three contractors so you have a sense of costs and trades involved. Find an experienced contractor who is specialized to the type of project you are undertaking. This means that in the case of a kitchen cabinet renovation, you would be best served to hire a kitchen cabinet contractor and not a handyman or contractor who is specialized in other types of work. Make sure you ask for references, photos, and if possible, ask to chat to people who have had work done by this contractor. Lastly, always be prepared to budget more than you think it will cost, because more than likely want to add more to your project than you originally considered. Hopefully this post has helped answer some your questions. If you are ready to renovate, or just starting to think about a kitchen or bathroom renovation, our design and project management team is available to discuss your project. Visit our showroom at 123 East 1st Street, North Vancouver, or call us 604.985.9128 to book an appointment for a personalized consultation. 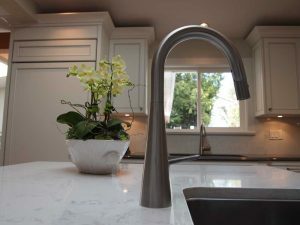 At Coordinated Kitchen and Bath we design custom renovations from start to finish, to create the perfect kitchen, bathroom, and home renovation every time.